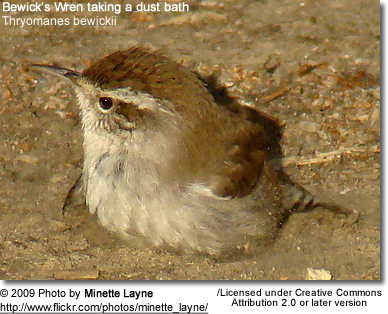 The Bewick's Wren (Thryomanes bewickii) is a wren native to North America. 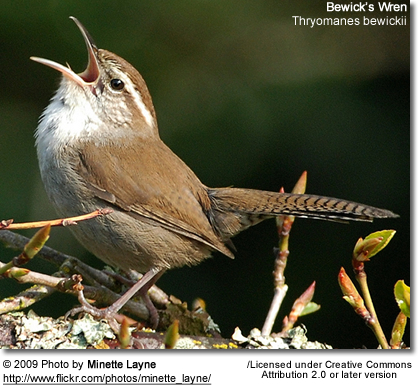 The Bewick's Wren was named for Thomas Bewick by Audubon. 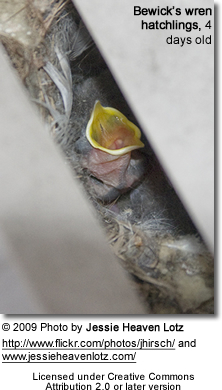 At about 14cm long / 4.5 inches, it is gray-brown above, white below, with a long white eyebrow. 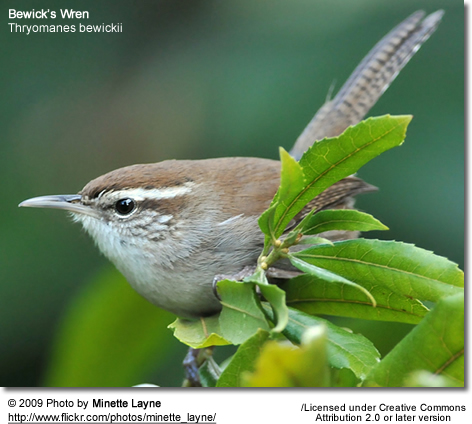 While similar in appearance to the Carolina Wren, it has a long tail that is tipped in white. 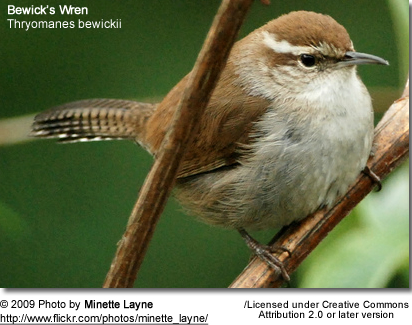 Similar Species: The Bewick's Wren can be distinguished from House and Rock Wrens by its bold white supercilium (line above each eye). Carolina Wren is rustier above and buffier below. Marsh Wren has a streaked back. The song is loud and melodious, much like the song of other wrens. It lives in thickets, brush piles and hedgerows, open woodlands and scrubby areas, often near streams. Its range is from southern British Columbia, Nebraska, southern Ontario, and southwestern Pennsylvania south to Mexico, Arkansas and the northern Gulf States. The San Clemente subspecies (leucophrys) of Bewick's Wren, found solely on California's San Clemente Island, went extinct soon after goats and sheep were introduced to the island. The subspecies brevicauda from Guadalupe Island suffered the same fate after 1903 for the same reason. It usually lays 5-7 eggs that are white with brown spots.